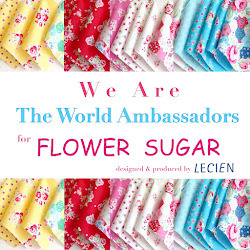 Sewn With Grace: They loved them! My ladies retreat was so much fun and they loved the scarves! What a joy it was to make all these beautiful women smile. 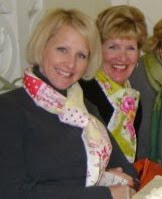 Joyce (I love pretty little things) and Debbie from my post "Apron Love" look fabulous in them! I apologize for the blurry pic, I'm still learning the ropes here. I hope all of you hug your friends today and make them smile! That was very sweet of you to do for your friends. I'm sure your frinds treasure the beautiful scarves you made for them. Guess I mussed a few posts. (Busy week and weekend). Love the apron you posted. I have a lot of aporn patterns, but not that one. Such pretty springy fabric. Sorry of all the typos, I should proof read. Of course they would love them! They're beautiful! :-) And you're so talented!